In Los Angeles, rain is nearly as elusive as Sonic (though the latter’s advertising campaign would like you to think they’re everywhere). 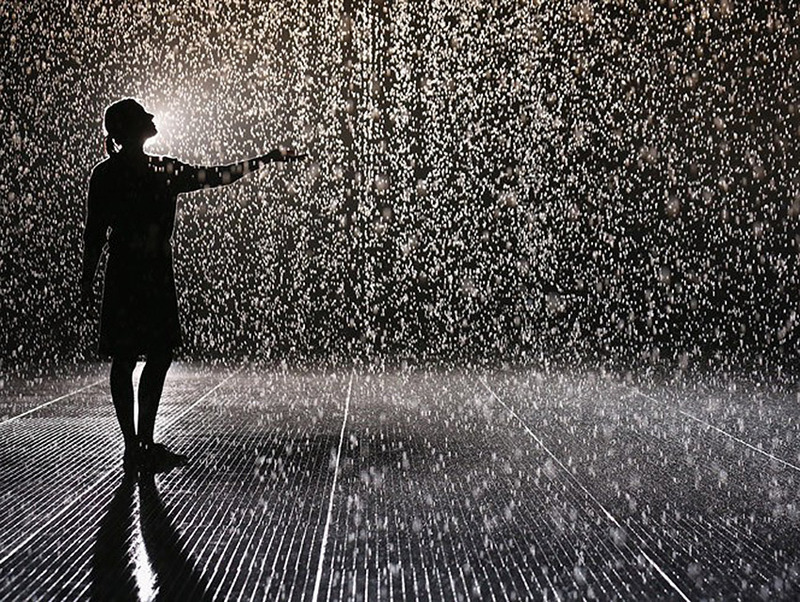 Which is why “Rain Room,” an exhibition opening at LACMA November 1, will likely blow the city’s collective mind. The artwork, which is headed our way after stops at London’s Barbican Centre and New York’s MoMA, simulates a rainstorm within a 2,500 square foot space. That’s not the cool part, because it’s like, have you been to Rainforest Café? What’s incredible about the piece is that viewers are able walk through the torrent without getting wet. While we wish this was the work of a particularly skilled member of The Magic Castle, it’s really a feat of technology: various sensors within the space are activated as people walk through; those sensors adjust the falling water to keep you dry. For those with drought concerns, the water used for the installation is recycled through a closed-loop system and requires little replenishment due to nominal evaporation. LACMA is planning to provide timed tickets ($10 for members and visitors 17 and younger; $15 for everyone else) for the event to manage the flood (ha!) of guests. According to the Los Angeles Times, MoMA’s iteration of “Rain Room” attracted 74,222 people over 11 weeks (about 1,000 people per day). Bottom line? Be prepared to wait for hours to stare at rain, something the rest of the country does on the reg.